If there were a sweepstakes for the most unlikely plot in a modern daily comic strip, Sea Urchins would no doubt take the prize. Let’s see if I can capture it all in a nutshell. The strips stars the Unrun family; mom Ali, dad Ole, and seven kids (Cuss, Germy, Sherfew, Ella, Darla, Shirley and Lucky Mordy), and they live in the mythical land of Terrasfumato. Ole has the whole brood living aboard a ship he built named the Banana Moon, erected by mistake too far from water to be launched. Ole is a veteran of the Great Sea Ape War, in which he lost a toe, and he has vowed revenge, just as soon as he can figure out how to get the boat in the water. Meanwhile, this decidedly eccentric family gets involved in wacky adventures with their friends and enemies in the nearby community of Nettletown. If this seems like a rather involved plot to throw at readers at the rate of one 2" x 6" strip per day, you're right. 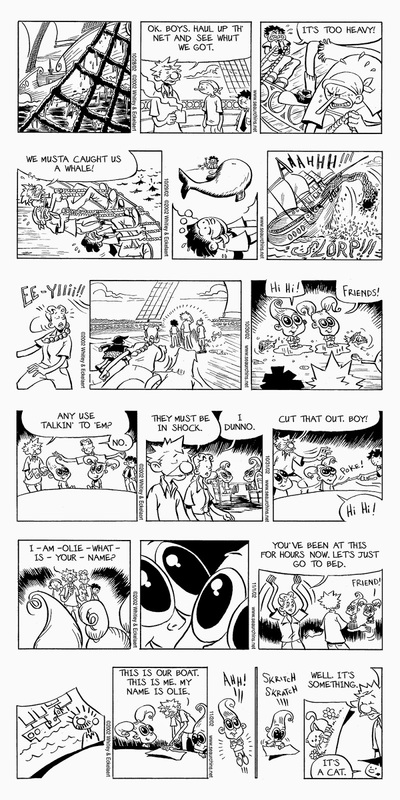 However, that was the dream of Sea Urchins creators Scott Eckelaert (writer) and Jason Whitley (art), and they actually realized that dream when they convinced the Myrtle Beach Sun News into running the strip on their daily comics page starting in February 2001. Early admirer Tom Heintjes (editor of Hogan's Alley) said of the strip, "When I first read Sea Urchins ... I didn't get it. When I went to the strip's website to read more of it, I still didn't get it ... But I kept reading it. And eventually I got it." I have to go along with Heintjes. 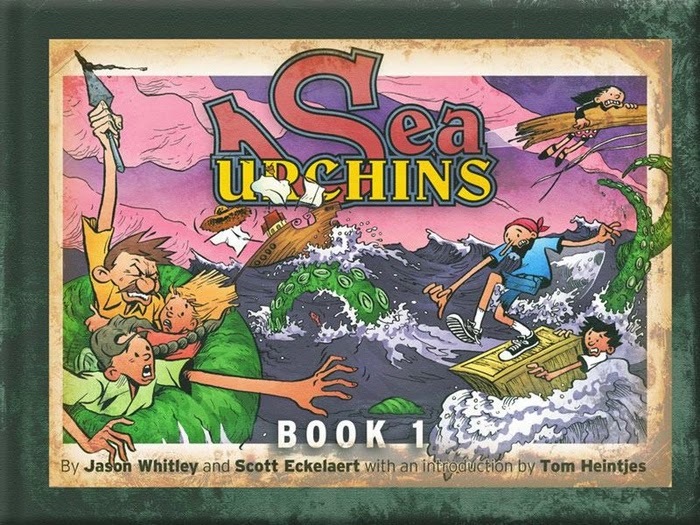 Reading the reprint book of Sea Urchins first published by Plan Nine Publishing in 2003, and now available as an e-book, I was initially confused, then dismissive, but by the time I got to the end of the slim book I was intrigued and hungry for more. The creators claim to be trying to resurrect the old-time continuity strips, citing Thimble Theatre and Prince Valiant among their favorites. They mention that the kids, oddly enough, were patterned (very loosely) on the street urchins found in Gene Carr’s Lady Bountiful. The early Sea Urchins strips are frankly a bit tough to read. Eckelaert and Whitley don’t really introduce the characters or explain their odd world (think Popeye’s Puddleburg crossed with Middle Earth). The strip meanders, not sure how to structure the gags or storyline, weaving between serious and humorous, and juggling a (literal) boatload of characters we don’t know, but that the creators assume we are as comfortable with as our own family. Once we get over the initial bumps, though, the writing starts to gel. The continuity begins to hang together, the story becomes sensible in its own weird and whimsical way, and the characters become familiar enough that we don’t feel like we walked in on the second act of a play. To the great credit of the Myrtle Beach Sun News, they stuck with the strip through those bumpy early days. In fact, the strip lasted over three years there, ending only when Whitley, who was employed by the paper, left for greener pastures. The strip ended October 30 2004, a victim not of reader disinterest but of creators who had too many other projects going on. However, Eckelaert and Whitley have never been able to completely close the door on Sea Urchins. 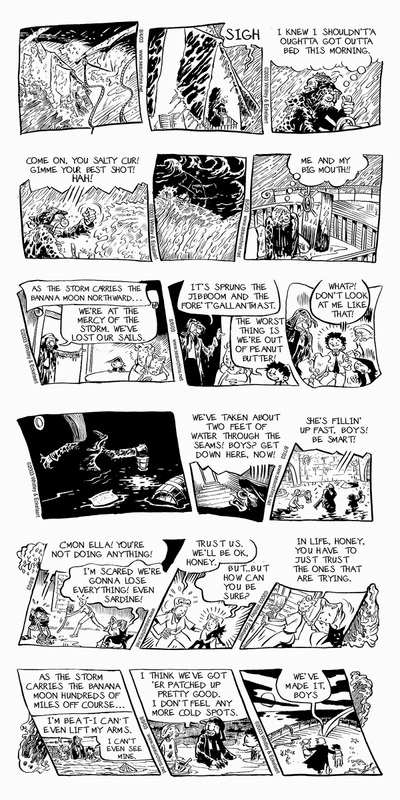 Since the newspaper strip ended they have produced occasional comic book stories featuring their characters, and just a few weeks ago they began a Kickstarter campaign to gather funds to print new reprint books of Sea Urchins, since only the earliest bit of the strip has been reprinted, and then only in a very scarce book (most of the publisher’s print run was destroyed). I was certainly entertained enough by book one to want the rest of the Unrun family’s saga in print form, so I made a contribution, and if you would like to place a vote that continuity strips aren’t yet dead, I suggest you do so too. Whitley and Eckelaert also promise that if they can find a demand, they would still be delighted to produce new adventures of the Sea Urchins. However, their experience in trying to tell stories in a postage stamp space leads them to prefer that the new adventures be produced for an online or graphic novel audience. I wish them all the best!